Our Dallas and Plano, TX, foot doctor offers expert treatment for various foot conditions, including hammertoes and claw toes. These deformities are often the result of genetics and can be exacerbated by wearing the wrong kinds of shoes, especially for women. Women’s footwear often includes pointy-toed high heels, which can create issues in the structure of the foot. Claw toes occur when when the toe joints closest to your ankle point up, whereas hammertoes result in toes that curl or bend downward, instead of pointing forward. 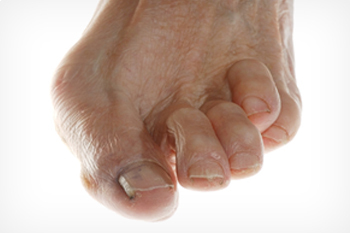 These deformities can cause the joints of your toes to rub uncomfortably against the inside of your shoe. When the condition progresses, your toes may become stiff and inflexible. If you suspect that you have or may be developing claw toes or hammertoes, we can help you with treatment and advice on shoes that may be better for your particular foot structure. What Causes Hammertoe and Claw Toe? At Dallas Podiatry Works, we don’t want to just treat your foot problems; we want to educate you. Knowing more about the source of your foot pain is empowering, and it allows you to choose a treatment plan that is right for you. No matter the cause of your painfully tight toes, our expert podiatrists are ready and able to create a custom hammertoe or claw toe treatment plan suited to your unique needs. The goal of our Dallas and Plano, TX, foot doctor is to address the root cause of your pain and make that pain stop forever. We are only satisfied when your feet are pain-free. Call our Dallas or Plano podiatry office at 972.566.7474 or click here to schedule an appointment with our Dallas or Plano, TX, foot doctor. Our podiatrists and staff are always ready to help our patients put their best foot forward!